Lake Tahoe is the scene chosen for Stan’s beautiful painting. 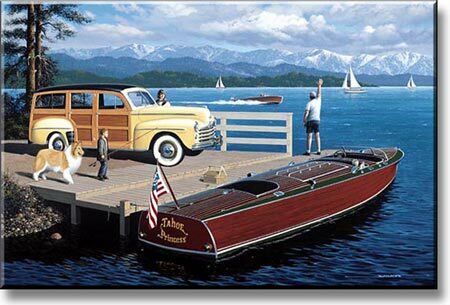 A Hacker speedboat and a Ford V-8 Super DeLuxe Woodie are the classics in this scene depicting a family’s Sunday outing on the lake. The squirrel in the speedboat better learn how to swim once the family’s pet Collie takes notice.